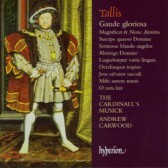 2005 saw the celebrations for the five hundredth anniversary of the birth of the great English composer, Thomas Tallis. Varied and versatile, he survived and produced excellent music throughout the reigns of four extraordinarily volatile and wilful Tudor monarchs. This disc is centred around his monumental antiphon Gaude gloriosa – a musical and dramatic tour de force. Other highlights inclde the stunningly descriptive Suscipe quaeso sung here at written pitch with a low and sonorous scoring, and the brilliant Magnificat and Nunc dimittis for five voices.